Over the course of the last two football seasons I have been playing with some pocket change on Bovada.lv. It’s a website where you can bet on the lines of NFL games to MLB games to The Oscars (seriously). Over time I have had a lot of fun making bets. I usually partake in betting on straight lines, but I’ve also been known to get involved in other kinds, including sweetheart teasers. What is a sweetheart teaser? A sweetheart teaser for the most part plays out the same way as a regular teaser, except a sweetheart gives the bettors even more points. You can shift the line by 10 to 13 points in football (that’s nearly two touchdowns). There are a couple of differences. While regular teasers can include up to 10 teams, a sweetheart can include only three or four teams. Also, if any of your selections push on a sweetheart, you lose the entire bet. Also, check out this link to gain a better understanding of the NFL spread betting. As you can see, sometimes the gamble can be quite large when betting a teaser. Who doesn’t like a good risk once in a while? 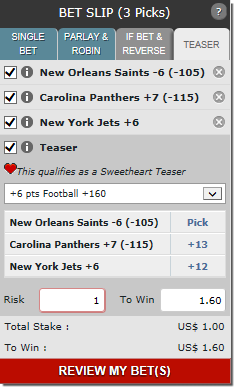 From this week forward, I am going to outline some of the bets I love, hate and my sweetheart teaser of the week! As of this writing there were no lines on the Dolphins/Lions, Giants/Seahawks or Cowboys/Jaguars games on Bovada. I wouldn’t have used any of these in my sweetheart teaser anyway. These are easily my favorite betsof the week and I will find multiple ways to include them inside a teaser and some other bets. The Saints are good at home, we all know the history. Couple that with the 49ers not being on the same page right now and we have a recipe for success (In order to win a $1 back you have to bet $1.05 but the line is soft enough for me that I wouldn’t hesitate laying some serious money on this game). 10 points can be scary and I rarely bet on lines this high but this one is too sweet not to lock down. The Ravens are 9-3 at home over the past two seasons and are coming off a lopsided loss to the Steelers, this is a team that’s going to want to come out and make a statement and I feel really bad for the Titans this weekend. Tennessee hasn’t done much right this season (Of course bet with caution but I really think that Ravens win this game by 20). Ricky are you trying to tell us that you don’t like a team that has a quarterback who’s thrown for 12 touchdowns over the past 2 games and an offense that has scored 40+ points in back to back games? Yep. I hate this bet this week, it’s a total trap game and a trap bet. Keep in mind this is the same Steelers team that struggled on the road against the Jaguars, got demolished in Baltimore and Cleveland and lost to the Tampa Bay Buccaneers. As you can see I am taking full advantage of the Saints dropping from a -6 to a pick ’em against the 49ers, which means they just need to win the game and we are covered. I really think Mark Sanchez and the Eagles win Monday night but the odds of them beating the Panthers by 13 points is not good. The Eagles have two blowouts this year (both came at home) but they were against the Jaguars (who were actually up 17 at the half) and the Giants. I like the Panthers to cover the 13 points with ease. Lastly, I spoke of the Steelers/Jets game being a trap game for the Steelers and that’s at the -6, but give me 12 points and I love the Jets this weekend. After playing around with various teasers this is easily my favorite. At +160, you can bet $5 and win $8 and so forth with the more you bet. One thing is for sure though, you will be thanking me Monday Night when the game is over. Ricky is a co-owner, fantasy sports writer and gambling man at The Sports Script. Follow him on the Twitter machine @rickygangster!